Alere Wellbeing has found that employers successfully increase participation in wellness programs when they reward healthy behaviors for participation in the Quit for Life program rather than focusing simply on enrollment or on the end result. By implementing an approach that includes a comprehensive program supported by a positive environment, you will find that this will potentially promote positive behavior change, positively impact your bottom line, and improve employee relations. When implemented successfully, a positive incentives program is actually an excellent vehicle for financing a tobacco cessation program and can potentially be cost-neutral. Many employers find that charging smokers a premium differential or surcharge can help pay for the non-tobacco users as well as fund the program for those who are trying to quit. 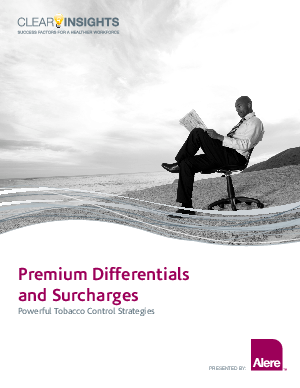 Alere Wellbeing defines what premium differentials and surcharges are and provides best practices from our clients.